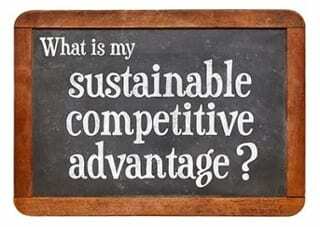 What’s Your Organization’s Sustainable Competitive Advantage? Sustainability and competitive advantage are no longer mutually exclusive concepts. As the public becomes more aware of the realities of environmental abuse, many consumers have begun to look to companies that are creatively employing sustainable practices. And many sustainable products and practices today are less expensive to use and not as capital intensive to buy than traditional ones. Sustainable solutions may lower cost and improve efficiency, resulting in a more favorable bottom line and competitive advantage. In a survey mentioned in MIT Sloan Management Review, 92% of business managers answered positively when asked if their company was actively addressing sustainability in the business. However, with further questioning, far fewer were aware of the competitive possibilities for their businesses. The economic downturn of 2008-2009 had caused several to turn away from sustainable activity to focus on what they believed to be more pressing issues. Managers who expressed a far deeper commitment to sustainability were able to cite ways in which the practice had helped their bottom line. These more enlightened executives embraced the more holistic “triple bottom line” approach which meant closely aligning business activity to the economic, environmental and social aspects of their business. To achieve a higher level of sustainability, businesses cannot operate in a vacuum. Collaboration with suppliers and even customers is often necessary. For example, suppose a company wishes to reduce packaging costs, eliminate waste and promote recycling and reuse. First they may meet with their raw material suppliers to find a solution for a different type of packaging for inbound raw materials. Options may be to use less packaging material, switch to only recycled packaging material or adopt reusable packaging such as crates made from recycled durable material. At the other end of the supply chain, collaboration with the client buyers and operations management for a sustainable solution for their products may uncover a creative, paradigm-shifting approach for their own inbound and outbound products. In addition, creative ideas for sustainable packaging can provide marketing opportunities for the customer-end users and elevate the creative supplier’s status and drive more volume. This collaborative supply chain process can result in lower costs for all and elevate the competitive advantage of each link of the chain. Replacing incandescent lighting with CFL or LED, with longer life and reduction in electrical consumption. Install sensors and timers to allow for lighting and other mechanisms to be shut off when not in use. Change filters regularly and provide regular maintenance on HVAC systems to enhance the efficiency of furnaces and air conditioners. Install low-flow plumbing devices and sensors. Set outside timers and sensors to allow for watering landscape only as needed. Use drought-resistant plants that look great and require little watering. Lower operating costs through reduced energy and water consumption drop straight to the bottom line. In highly competitive industries in which more efficient practices can lower operating or component costs, a company can become more profitable, assuming sales volume and other expenses hold steady. Many times, in this instance, management may opt to lower or hold pricing with a view to gaining market share against the competition. Increased share should lead to more profitability and a brighter future in many cases. Marketing sustainable practices may also drive top line sales. Consequently competitive advantage does co-exist with sustainability. What’s your organization’s sustainable competitive advantage? Tell us about it in the comments!